Haines Hunter managing director John Haber's personal Haines Hunter 760 R Ltd. Check out the twin Yamaha 225hp outboard motors. Haines Hunter 650 R which did so exceptionally well in our Australia's Greatest Boats 2010 fishing boats shootout in the (Fibreglass Fishing Boats category). The unmistakable red hull of the Haines Hunter 600 R of Charlie Micallef's Savage Seas Adventures. 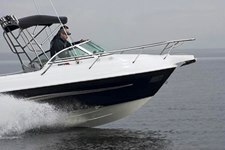 The Haines Hunter R Series of boats are the top of their range, second only in class perhaps to the Haines Hunter R Limited series. A monster Haines Hunter 760 R Ltd. Every option imaginable is on this boat and there's 500hp on the back. 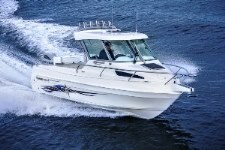 The Haines Hunter R series of boats is very much about performance, handling and outstanding fishability. One of our favourites is the Haines Hunter 650 R. The Haines Hunter 650 hull has developed into a number of formats over the years, including the 650 Classic, Limited and formerly the Horizon cruiser and Prowler centre-console. Back in 2010, the Haines Hunter 650R Limited dominated our inaugural Australia’s Greatest Boats shootout in the Fibreglass Fishing Boats category, triumphing amid a field of first-class contenders. The boat has heaps of deck room and high coamings, and it’s eminently capable of carrying the big, new 300hp four-stroke outboard motors that can send it hurtling along at speeds in excess of 43kts (80kmh). Furthermore, it has the hull design and capacity to match the power, and it’s completely predictable even at high speeds. It’s also exceptionally soft riding and stable at rest. The cabin and passenger ergonomics are first class, and the dashboard is designed to carry twin binnacle controls and the 12in monitors that are popular with serious offshore devotees. Haines Hunter continues to teach old sea dogs new tricks with innovative bluewater machines. John Willis reveals 10 things you need to know about the new Haines Hunter 585 R Limited.